I want to introduce you to an eBay alternative. Allsorta.com is a sister site to Homeschool Classifieds where they have sold strictly Homeschool related materials for a long time. They have now branched out with a new site to sell goods and services. The first 100 listings are free. They have paid memberships with 200 listings per year at 10.00 or 300 listings for 20.00. Take one listing down and replace it with another. I believe this will be a really great place to buy and sell once the word gets out. You can check out my listings periodically if you like. I have Christian inspirational reading available at great prices.My seller ID is Raindropsonroses. This is not an auction site. You contact the seller by email if you want to buy an item, or if you are selling, the buyer contacts you via email. I know I haven't been in here in way too long. I wasn't to sure on which page to post this, but I plan to totally revamp my blog anyway soon. So I decided to just go ahead and put it in here for now. Here's my story. Many years ago, in the big woods of Wisconsin.....because it gets very cold in the winter.....we thought we would be really smart and outwit the cold by installing a nice pellet/corn Stove. That was our first mistake. It was a Country Flame. Run by computer...bad mistake. I can't tell you how many times Steve moaned over the fact that this machine didn't come with just a plain old on/ off switch instead of a touchy techy computer! Oh, Please! He called it The Country Blame. It worked exactly half the time. After 3 or 4 winters of seeing it sit worthless in my living room. I got this great idea. I wondered.....was there a way to make a false fireplace, just for looks? That's where Pinterest came in. Oh, what a lovely place is Pinterest! The place where I pin things that I think would be great to do someday and then I never do them. But this time was different. It took me about an hour to convince Steve that this was a great idea. But he did it. I think the reason he did was because I threatened to do it myself and he was afraid of what it would look like. But he is a master at building and so he pleased me ever so much when he came inside with a very nice looking corner fireplace. I painted it Black. (forgot to take pictures) But the old corn stove went OUT. My reasoning was that its not heating our house anyway, I might as well have something there that I like. I learned from Pinterest that you can make a faux fire with logs and Christmas lights. I wasn't completely satisfied with the look, So I searched some more and came up with another solution. A fireplace Screen to hide the fact that there really isn't a real fire in there. So here are the pics of the process. My faux Fireplace, after I made the fireplace screen. This was a frame around a mirror that my dau-in-law just gave me recently. It was a perfect size. We sanded it and painted it using a satin Black Acrylic Paint. The rest of the materials were an easy fix too. Twigs from the yard and cardboard leaves from a cereal box. I planned to spray paint the leaves and twigs but the shiny side of the cereal box didn't hold paint. So we (me and my kids) ended up painting them with a brush using the same paint that we used for the frame. Twigs and leaves before we painted them. I cut 6 of the twigs to fit and hot glued them with a glue gun. I hot glued the leaves on too. Here it is. Mostly done. I still need to get my hands on some screen. I considered using Black lace fabric, but it just didn't look right. So for now it doesn't have any. I am hoping to find an electric log with the crackling fire sound, but until then my Christmas lights will have to do the job on their own. I don't know what the plywood cost that Steve used to build the "fireplace" I am assuming they were scraps he had laying around from some other project. Every thing I used was free stuff I had available here at home. So my cost for this project was next to nothing. It looks good for now. Steve is planning to find a gas parlor stove to put here before next winter. 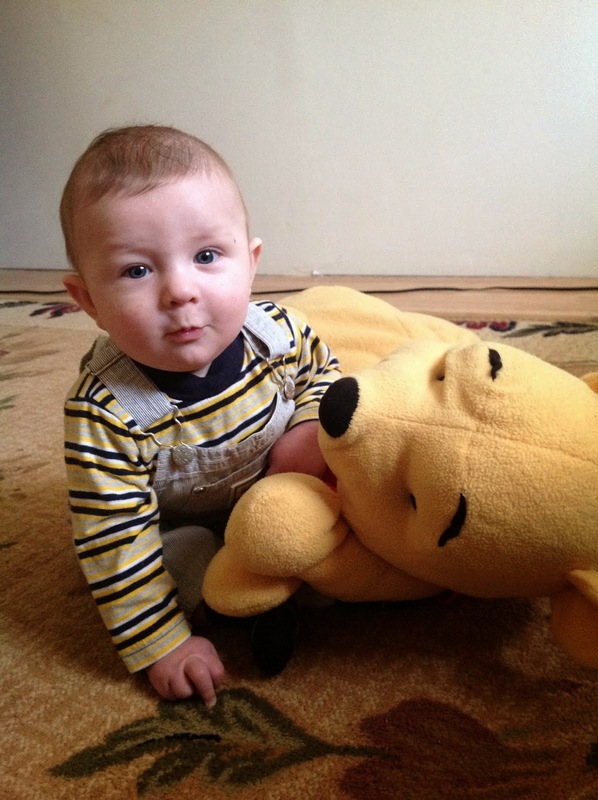 And here is the sweet Grandson that is coming on Saturday to find out if the thing is actually child proof. What do you think my chances are?